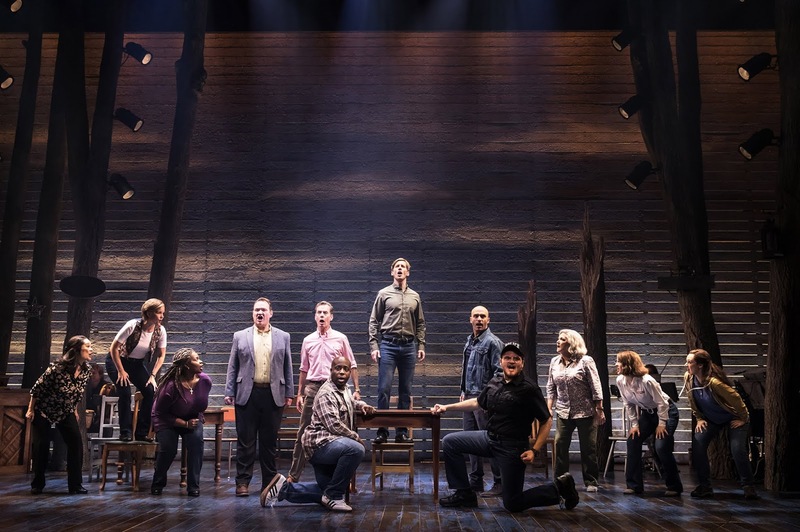 Theatre Eddys: "Come from Away"
Like almost everyone worldwide and everyone in the opening night audience of SHN’s Golden Gate Theatre, citizens of Gander, Newfoundland remember where they were at 8:46 a.m. on September 11, 2001. But unlike the rest of us, the 9000 inhabitants of this remote island province of Canada also remember seeing thirty-eight planes land at their airport, eventually to unload into their tiny community 7000 dazed, scared, sleepy, hungry passengers and crew – all desperately in need of a hot shower and clean clothes. 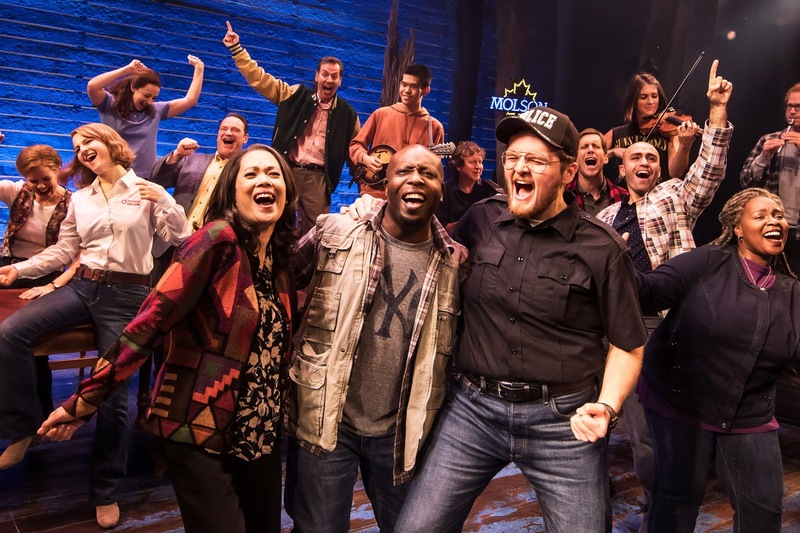 How this town and the even smaller villages around it responded over the next five days is the subject of one of the most riveting, inspiring, heart-warming, and yes, funny musicals to come to the American stage in recent years. 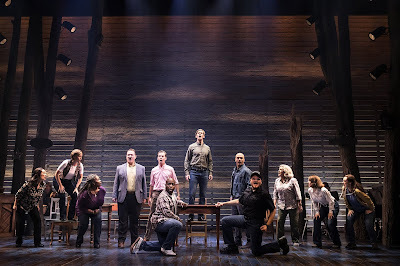 The immediate, sustained standing ovation full of loud, long ‘hurrahs’ at the evening’s end for this touring production now in San Francisco echoed the similar responses Irene Sankoff and David Hein’s Come from Away has consistently received since its 2015 joint world premiere at La Jolla Playhouse and Seattle Repertory and since its 2017 opening on Broadway, where it still rocks the Gerald Schoenfeld Theatre nightly (as well as on stages in Dublin, Toronto, Melbourne, and soon London). From the initial thump-thump, rollicking beats of the opening “Welcome to the Rock,” Tony Award winning Director Christopher Ashley quickly establishes a sense of tension, urgency, and anticipation even as the full company of Come from Away recall how normal that September morning began for each. Town members jerk their torsos, stomp one foot, and move with purpose as they recount in song and speech the moments leading up to the sight of the first planes. As in most of the musical’s fifteen numbers, “Welcome to the Rock” features the entire, on-stage company, with all members taking their turn to spotlight the true-life story of either a passenger, a crew member, or a townsperson (with all dozen outstanding cast members playing one key and many other multiple roles). What makes the one-hundred-minute, no-intermission musical especially compelling is that it is based on interviews Irene Sankoff and David Hein conducted at the tenth anniversary reunion of the citizens of Gander and many of those that were forced to be there for those five harrowing but also life-affirming and life-changing days – with most of the real-life names and their related stories retained in the pulsating, punchy script. The Baptist church moves out its pews; a school prepares to fit 700 people where 400 students usually reside; the Lions Club looks for all the extra toilet paper it can find while the local Shoppers offers up for free anything on its shelves from aspirin, mouthwash, deodorant, diapers, and tampons (all related by madly rushing Ganders in the heart-pounding -- yet also hilarious -- “Blankets and Bedding”). With an immediate switch of roles and the use of wooden chairs now crammed together in the shape of a crowded plane, the cast quickly relates what it was like to be on those planes in “28 Hours/Wherever We Are,” with little-to-no news and only rumors of why they are there and why they cannot get off. 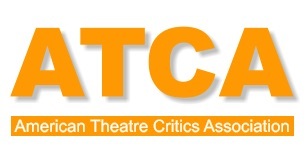 (“An accident?” “A helicopter crash in Pennsylvania?”) The cleverly directed movements (staged by Kelley Devine) of those on the stranded planes becomes a mostly seated, but totally vigorous dance of mixed boredom, discomfort, impatience, and fear. “What’s happening?” is the continual refrain that frightfully pops up between sung and spoken narratives of the trapped passengers. When the passengers from countries all over the world finally begin to disembark into lines of yellow school buses (made available by striking drivers who set aside their bitter labor-dispute in order to help), they sing with trepidation of “Darkness and Trees,” in a haunting number where those who cannot speak English are particularly frightened when greeted by smiling Salvation Army volunteers in their military-looking uniforms. But the big hearts and generosity of the Gander people begin to win over the exhausted passengers, and stories emerge of lives of both visitors and hosts becoming forever intertwined and thus changed. The combination of musical numbers being both sung and spoken while accompanied at all times by an onstage band of instruments like fiddle, mandolin, Irish flute, harmonium, and accordion (all conducted by Cynthia Kortman Westphal) makes the story-telling all the more powerful. Impossible it is to sit without moving, tapping, or snapping something of one’s own body – all the time leaning in as wave after wave of human interest stories comes from both those forced to visit and those stepping up to welcome. Unlikely romances form like that between a Texan divorcee (Christine Toy Johnson) and an Englishman (Chamblee Ferguson) as their Diane and Nick try to “Stop the World” long enough to fall in love amidst the beautiful scenery in a world now full of terror. On the other hand, two gays both named Kevin (Nick Duckart and Andrew Samonsky) find that the strain of what has happened opens up relationship wounds that probably had long been festering. Throughout the many singular stories, there is a pervasive intensity and edge that electrifies the air, with everyone trying to find out what has really happened and to whom. We are in wide-eyed awe as we watch these people respond to each other with heart, hope, and help in the midst of terrifying tragedy. Yet all along the way, we in the audience surprise ourselves as we continually erupt in out-loud laughter. Human nature and our often awkward, unrehearsed reactions to foreign situations are indeed funny. A chorus line of volunteer bathroom cleaners in rain slickers and a cod-kissing ceremony to initiate new Newfoundlanders (while drinking the rum-based “Screech”) are just two of many scenes where laughter erupts in amidst other scenes where holding back tears is difficult. The grandeur and beauty of the story is enhanced by the simple but majestic scenic design of Beowulf Boritt with its tall, northern pines and use of mostly wood-backed chairs as movable scenic pieces. The lighting of Howell Binkley creates a world of northern night sky wonder and spotlighted silhouettes while Gareth Owen’s sound design ensures not one phrase of this spoken/sung narrative is ever lost. Finally the costumes of Toni-Leslie James bring together both a local array of characters and a world of visiting cultures. 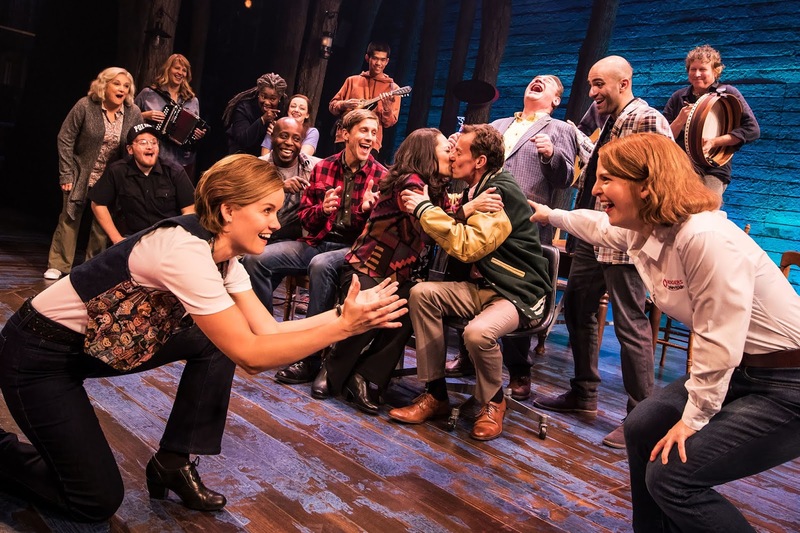 Come from Away continues through February 3, 2019, at SHN’s Golden Gate Theatre, 1 Taylor Street, San Francisco. Tickets are available at Tickets are available at https://www.shnsf.com.